PSALMS 108:3 KJV "I will praise thee, O LORD, among the people: and I will sing praises unto thee among the nations." 1(A Song or Psalm of David.) O God, my heart is fixed; I will sing and give praise, even with my glory. 2Awake, psaltery and harp: I myself will awake early. 3I will praise thee, O LORD, among the people: and I will sing praises unto thee among the nations. 4For thy mercy is great above the heavens: and thy truth reacheth unto the clouds. 5Be thou exalted, O God, above the heavens: and thy glory above all the earth; 6That thy beloved may be delivered: save with thy right hand, and answer me. I will praise thee, O Lord, among the people: and I wil sing praises vnto thee among the nations. I will give thanks unto thee, O Jehovah, among the peoples; And I will sing praises unto thee among the nations. I will give you praise, O Lord, among the peoples; I will make melody to you among the nations. 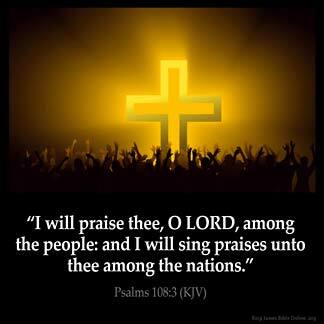 I will praise thee, O LORD, among the people: and I will sing praises to thee among the nations. (108:4) I will give thanks unto Thee, O LORD, among the peoples; and I will sing praises unto Thee among the nations. I 'm not be a shamed to talked about my lord , my savior , my salvation, God is my shelter . I 'm not feel embarrass to praise him , to glory him ,I don 't care whoever around me I opened it all my mouth to sing to Jesus . He gave me life , he died for me . His restore my life. He did a lot of the thing for me. I love my lord Jesus. I will Praise my Lord and my God. Out of the mouth of babes hast thou perfected Praise. Praising God stills the enemy and avenger !!! I will Praise thee with all my heart for thou hast done wonderful works toward me. your Grace is sufficient and you mercy is everlasting. I will Praise thee, Oh my Lord !!!! I will Praise my God with my whole heart among the heathen will I lift up your Name. I am not ashamed to give my Lord the Glory that is due unto His name. Praise GOD. WE ARE OVERCOME By the words of our testamony. PRAISING AND THANKING GOD IS WHY WE WERE CREATE. WORSHIP GOD IS WHAT WE are created for. I don 't care what the world may do, I 'm going to praise His name. David made a declaration that he would praise the Lord no matter who was around. We too must be bold in worshipping our God. Letting Him know how grateful we are for His kindess and tender mercies and letting people know in whom we trust and where our help comes from the Lord above. When we send up praises to the most High God, then He sends down blessings of peace, joy, and love that fills us up and blesses our souls. I will praise my God and His dear Son Jesus whereever I am and no matter who I am around. Praise the name of the Lord all that is within me! I'am not ashamed of the gospel. I will praise God among the nations, and i will tell of His good ,great and wonderful works that He has done. Praise the Holy Name of the Lord from sunrise till sunset. Halellua Glory.